KHARKIV, Ukraine – Ukraine on Tuesday called off a regional cooperation summit of Central and Eastern European nations that has been boycotted by most heads of state over the treatment of jailed former Prime Minister Yulia Tymoshenko. 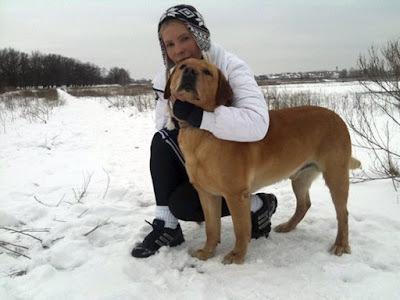 Ukrainian former Prime Minister Yulia Tymoshenko poses for a picture with her Labrador dog, named Boss, outside Kiev in this winter 2011 handout photo. More than a dozen heads of state have refused to attend the summit on Friday and Saturday in the Crimean resort city of Yalta after Tymoshenko went on a hunger strike to protest an alleged beating by prison officials. The Ukrainian Foreign Ministry said it decided to postpone the summit until a later date because of the leaders' inability to come. Ukraine faces harsh Western pressure for the jailing and alleged mistreatment of Tymoshenko, with some politicians calling for boycotting the Euro 2012 football championship the country is co-hosting in June. Tymoshenko was sentenced to seven years in prison on charges of abuse of office while negotiating a natural gas import contract with Russian in 2009. Tymoshenko charges that her arch-foe, President Viktor Yanukovych, has ordered her imprisonment to bar her from October parliamentary elections. Meanwhile, Tymoshenko, who suffers from constant pain due to a severe back condition, again refused to be transported to a government-run clinic in the eastern city of Kharkiv where she is imprisoned, saying she needs more time to consult with her lawyers. A German doctor was in Kharkiv on Tuesday to inspect the hospital where she has been offered treatment and to examine Tymoshenko, who has refused food for about two weeks. Tymoshenko was taken to that hospital against her will last month and was returned to jail two days later after refusing to be treated by Ukrainian government-hired doctors. But she later gave preliminary approval of being treated at the Kharkiv clinic under the supervision of the German doctor, and it was unclear why she refused to begin treatment Tuesday.